Here you can have a look on pictures of famous greek mythology paintings,which are kept in the museum "Hermitage" in St Petersbourg, Russia. Theme:Danae,mother of Perseus, lays in bed waiting for Zeus transformed as golden rain. 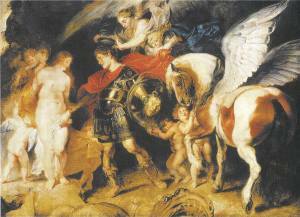 Theme:Perseus rescues Andromeda on his return trip after slaying Medusa. 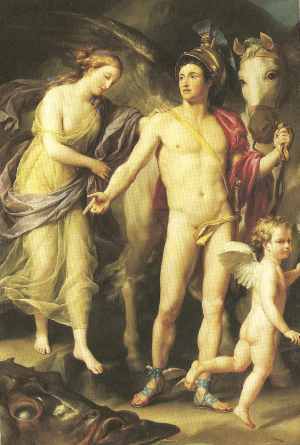 Theme:Danae,waiting for Zeus,while Eros hovers above her. Theme:Various mythological deities set in a beautiful landscape. 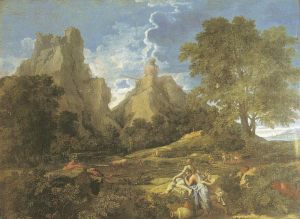 Name:"Landscape with Apollo and Sivilla"
Theme:Andromeda follows Perseus and Eros after her rescue. 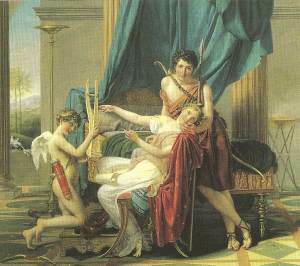 Theme:Female poet Sapfo with her lover Phaeon, who is struck by Eros' arrows.